I do not think You could put a price on The environment and the health of the planet and it's beings. Mack, Bp has more money than all the people in the US could ever dream of having combined. This will not even put a dent in what they have even if there could be a price on the environment. We will never be able to seize their assets. They are way to powerful and sadly we will end off paying not them. 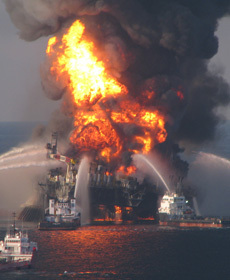 I live in Florida and BP can never restore the life it has destroyed in the Gulf of Mexico. business uses the term 'externalities' and this is what needs to be the guide: every single travel agent, waiter, souveneir shop owner, tour guide, barber, every beach, every crab, every every that was effected in the most peripheral way should not be forgotten, and for as far forward in time as needed.